Pass the twine round the rope and tie an overhand knot. Repeat behind the rope and tie another. Continue making overhand knots in front and behind to reach the diameter of the rope. Finish with a square (reef) knot. Or add more overhand knots, thread the ends through the rope and trim them. Animation To photograph this animation, large diameter cord was used. When tied with normal whipping twine, this makes a satisfactory, neat whipping. 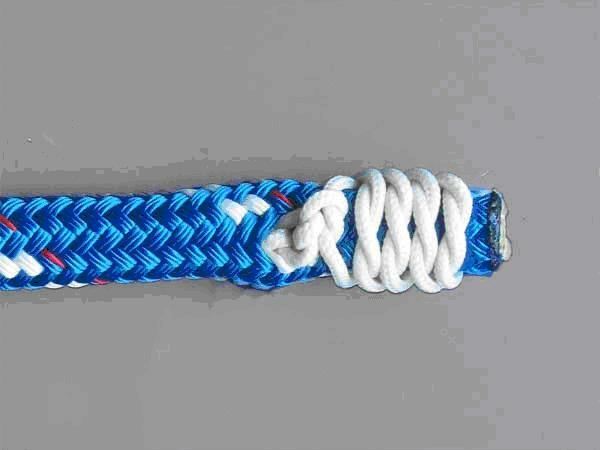 Uses: The West Country Whipping (ABOK # 3458, p 548) must be the easiest whipping to teach and learn – merely a series of overhand knots completed with a reef knot! No equipment is required except the whipping twine. At best, it is only a reasonably satisfactory way of securing the end of a rope. The final reef knot can shake loose followed by each overhand knot. However, it does fail slowly – the overhand knots work their way loose in succession and, as each one loosens, an opportunity is presented to procrastinate: tie another reef knot and put off having to whip the end properly with a better whipping. Where to Start: When whipping a rope’s end it seems natural to wind the twine outwards towards the end. There is, however, an advantage in starting at the end and winding the twine inwards: when the whipping is completed, the ends can be pulled through the body of the rope to prevent them unravelling. Reef Knot: The classic description completes this whipping with a reef knot with the ends trimmed. A heavily used rope will shake this reef loose. If a needle is available it is worth burying the ends by pulling them through the rope. Multiple Reefs: The West Country can be completed with a stack of reef knots but this leaves an unsightly tail. If a needle is available, this string of reefs can be pulled through the rope to bury it. Start with a Constrictor: A quick way to start the West Country is to drop a Constrictor Knot on the end before tying overhand knots. This has the advantage of quickly gaining very secure control of the rope’s end. It also leaves a fairly reliable last defense if the whipping comes undone.